Assam Science And Technology University Recruitment 2018 | Research Assistant & Post Doctoral Fellow :- Assam Science and Technology University (ASTU), Guwahati is a premier technical university funded by Government of Assam for promoting high quality science & Technical education and research in the state has recently published a recruitment notification in August 2018 . The university is developing a state of Art Central Research Hub to benefit researchers of its affiliated colleges/Institutions and the NE region in general. To accelerate scientific infrastructure development and R &D activities the university invites applications for Research Assistant and Post-Doctoral Fellow (PDF) . 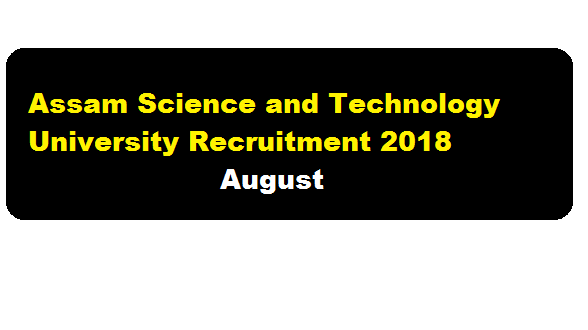 In this section, we will discuss in detail about Recruitment of various posts under Assam Science And Technology University Recruitment 2018 August with all the details and requirement. i) Research Assistant (RA) : M. Tech in (Civil/Chemical/Mechanical/ Electrical/ Energy Engineering / Electronics / Instrumentation, Agril. Engineering/ allied disciplines), M. Sc. (Physics /Chemistry/allied disciplines) with a minimum of 60 % marks in aggregate (or equivalent CGPA). The candidates may get chance for research for completion of doctoral degree based on quality and performance in research and subject to fulfilment of required criteria as per the university norms. ii) Post Doctoral Fellow (PDF) : Ph.D. in any discipline of science & technology from recognized university/ institute. The eligible and interested candidates may send application with complete bio- data to: The Academic Registrar, ASTU, Guwahati, Email: regacad.astu@gmail.com within 15 days of publication [06/08/2018] of this advertisement. Only shortlisted candidates will be intimated for interview. No DA/TA shall be paid for attending the interview.